A stealthy tech startup in Cambridge, MA, is unveiling its product to the world today. Oh, and what its product does is build other products. 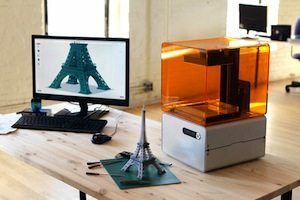 Formlabs, a one-year-old company founded by MIT alums, has developed a low-cost 3D printer—a desktop device that fabricates models for industrial designers, architects, and engineers. The device is available for purchase via Kickstarter, the crowd-funding site, starting at about $2,300. The printer produces small, handheld models made of a hardened resin via stereolithography (the build volume is 4.9 x 4.9 x 6.5 inches). 3D printing technology has been around for many years, but professional versions tend to be expensive and hobbyist versions are niche-y. The founders of Formlabs—Maxim Lobovsky, David Cranor, and Natan Linder—met as grad students at the MIT Media Lab in 2009. Their vision is to bring professional-quality 3D printing and “personal fabrication” (make your own stuff) to the masses—or, at least, to anyone who uses computer-aided design (CAD) software. To that end, they have raised an undisclosed amount of seed funding from investors including Mitch Kapor, Joi Ito, and Eric Schmidt’s Innovation Endeavors to get Formlabs off the ground. This is a very interesting company to watch, especially given the trend toward personalized product creation, the growth of the maker community, and the mainstream public’s seemingly increasing appreciation for design. Plus they are making real stuff. And it involves a laser. Who doesn’t love lasers? Xconomy: What was the genesis of Formlabs? Is the technology an outgrowth of your work at MIT? David Cranor: The technology isn’t an outgrowth of our work at MIT, other than the motivation—we were heavily involved in the Fab Lab program and witnessed firsthand the power of making high-end tools available to the community. Max has been involved in the field of personal fabrication even longer—he led the Fab@home project at Cornell while he was an undergrad. We were universally frustrated at the high cost of these types of tools, so when we graduated we started Formlabs so that we could continue bringing fire to the people, so to speak. X: What is the selling price of the printer, and the key innovation enabling low cost? DC: The printer is available for less than $3,000 on Kickstarter. The technology it is based upon is one of the oldest 3D printing technologies—stereolithography. Traditionally, this process has required a laser which costs tens of thousands of dollars. However, thanks to the recent development and mass production of Blu-Ray, we can now get a laser which does the trick for tens of dollars. X: We’ve been hearing about 3D printers for years, as a novelty. Why is this a big business? DC: 3D printers have actually been big business for around 20 years; the worldwide market for them is around $1.4 billion. They are a workhorse tool for industrial designers, engineers, and architects who want to prototype ideas and concepts during the design process. Problem is, they have been very expensive and difficult to use, costing tens to hundreds of thousands of dollars. There has been a market which has emerged for hobbyist machines in recent years, but those machines don’t come close to the performance required by professionals. Our goal is to bring professional quality 3D printing to the desktops of professionals at a cost that individuals can afford. X: Can you give a sense of your addressable market? DC: There are around 30,000 professional 3D printers installed around the world, and around 10 million users of 3D CAD software. We’re targeting that disparity. X: So what will people use this for, and how could this ultimately change the world—or at least certain industries? DC: Our product is intended to enable anybody who uses 3D CAD software in their work to quickly, easily, and affordably make their ideas physical. Because of the tremendous cost reduction and usability improvements over currently available offerings, we hope to make this great technology available to orders of magnitude more designers, engineers, and makers than ever before. That means more awesome products making their way into the world in the future. Is this available on any stock market yet?